Faisalabad (Monday, July 16, 2018): – The central Directorate of National Savings of Pakistan will hold a latest Rs.750 Prize bond (Seven Hundred & Fifty Rupee) balloting in the office of Qaumi Bachat Bank Faisalabad near Kacheri bazar FSD dated 16.7.2018 Monday. This is the 75tH Draw of Prize bond 750 denomination that is going serial wise for each Prizebond and the number increase +1 after each 3 months. 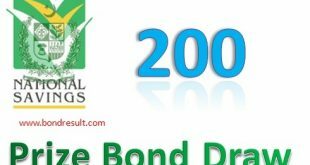 The Prize bond 750 List July 2018 will be updated on this page as the draw is complete. Usually the balloting starts 9:00 am and the first & second lucky winners are updated that time on Kohenoor TV but the full draw with 3rd winning list is updated on 5:00 pm. This draw list may be late due to the several reason and sometime that is updated on next day morning. We will updated you about Rs. 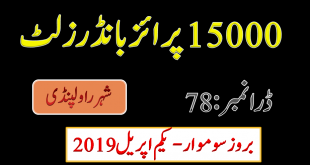 750 Prize bond draw list July 2018 held Faisalabad here. Afterward you buy your desired denomination prizebond your must keep updated your knowledge for the schemes and dated used to draw all the winning lucky numbers. In Pakistan National Savings have introduced Nine different amounts denomination including Rs.100, 200, 750, 1500, 7500, 15000,25000, 40000 and Premium bonds of 40000 Denominations to get in dive for winning high amount prizes offered by National savings Government of Pakistan. Each bond has winning amount of Prizes according to its price. The high the price, high is the winning amount of the lucky number. The 750 Prize bond have good amount of winning money prize that inspired low income persons to participate each time to spin their luck each time. The winners of the 1st and 2nd prize category received high amount of money in Lac’s and the third prize winners win’s only 9300 amount of Prize from which the 20% tax will be deducted. The first prize winners of Rs. 750 Prize bond draw held on 16.7.18 will got the amount of Fifteen Lac Pakistani Rupee but the prize quantity is only one. The 2nd prize winning money amount is Five Lac Rupee that is for three lucky winners and both of the aforesaid amount are very good for the average money income person and they surly love to got it.